Stage 1: it increases the torque and the power without any other necessary modification. Ideal for a little preparation. Stage 2: more suitable for a big preparation, it requires other modifications, such as high-compression pistons and big carburettor, to deliver its advantages. List of compatible models 504053. Other thousands of pieces with. The deadlines can vary 2 to 15 working days, contact us before the purchase. New parts in their packaging. Anti-theft, batteries, spark plugs, chain kits, pinions, crowns, chains, clutch discs, air filters,, oil filters, fuel filters, oils, engine gaskets, spinnaker gaskets, brake levers and clutch grips, grip pads, jaws brake, fixed and floating brake discs, brake pads, motorcycle tires, cross and enduro tires, scooter tires, quad tires, inner tubes, lamps and spotlights, wheel bearings and steering bearings, spraychain, turn signals, mirrors, fork tubes, cables, tank caps, handlebars, saddles, bolts, handlebars, valves and stoppers, contactors, workshop saddles, footrests, belts, exhausts, tools, top cases and windshields. Helmets, rain gear, clothing and anti-cold accessories, tire cover, etc. 03.25.55.74.71 Monday to Friday from 9h-12h to 14h-19h. 06.62.69.50.19 from 9h to 20h / Monday-Saturday. 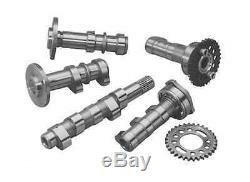 The item "camshaft hotcams quad yamaha yfm660r raptor 00-05 stage 1" is on sale since Wednesday, May 29, 2013.